The Game of Thrones premiere was running almost an hour late when a familiar voice echoed over the loud Radio City sound system. Sansa Stark, the Lady of Winterfell, was addressing her public. Well, Sophie Turner as Sansa was warning the audience not to post pictures, videos, or spoilers from the night, but it turned into a mini comedy routine between Sansa and her sister Arya (a.k.a. Maisie Williams). Eddard's girls bickered about how Arya would murder anyone who dared let their device ring. "If your phone should happen to ring during the show, your face would look lovely on my sister's wall," Sansa said. "We take these matters seriously. You should as well." Arya butted in: "Remember what happened to the last person who fucked with us." I tell you this in part because it was funny to hear the Stark pair let loose, but also because I can't actually tell you anything about the episode we then saw or offer you a review. You'll have to wait until April 14, like most of the world. 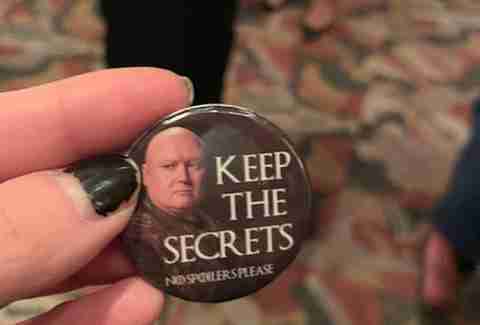 And do you really want spoilers? Game of Thrones has made its name on surprises, so why ruin that now? But the premiere itself wasn't shrouded in whispers. 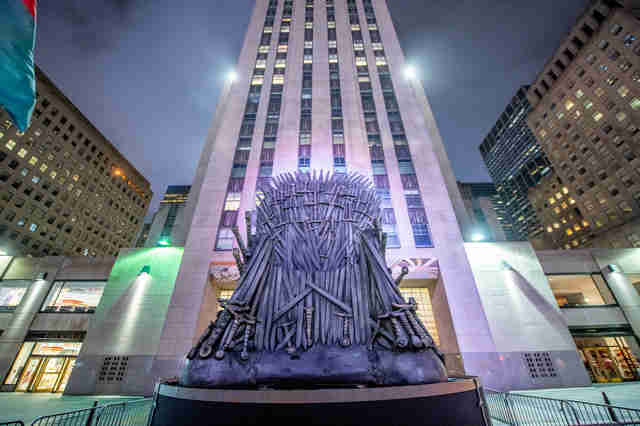 Instead, Thrones essentially took over Rockefeller Plaza for the evening. A giant -- and we mean giant -- replica of the Iron Throne was erected in the spot where the Christmas tree usually stands. It sat at the end of the red carpet, which also decked out in the series' iconography. 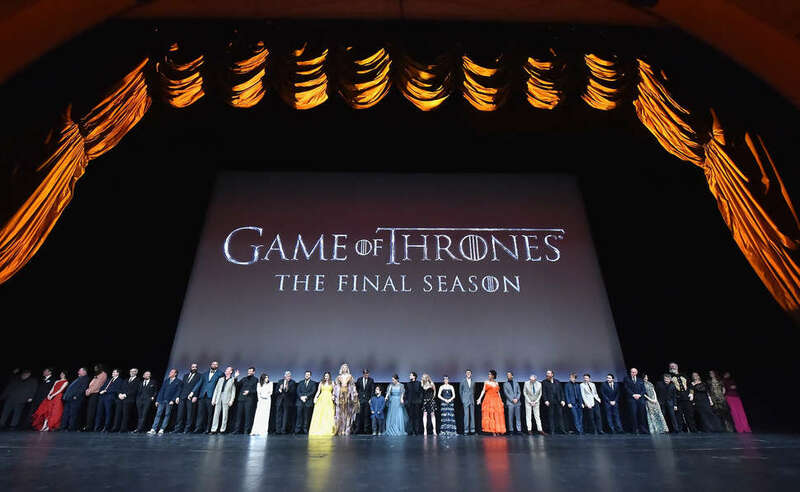 Fans clamored to get a look at the past and present members of the cast that were on hand, including many who've long departed the world of living Game of Thrones characters. 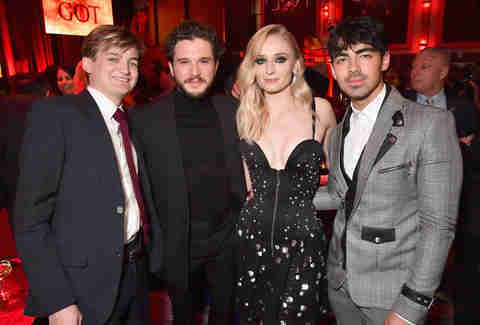 Jack Gleeson, who played the psychopathic nightmare of a boy king Joffrey Baratheon, was there, as was Pedro Pascal, known for getting his skull popped open as Oberyn Martell; Khal Drogo/Aquaman himself, Jason Momoa, showed up. Inside the theater, where footage from the carpet was being broadcast, audience members cheered when erstwhile Ned Stark, Sean Bean, appeared. Celebs from outside the Seven Kingdoms schmoozed inside the auditorium as the 7pm start time rolled by. Various stars of other HBO shows, including John Oliver, Silicon Valley's Thomas Middleditch, The Deuce's James Franco, and 2 Dope Queens' Jessica Williams and Phoebe Robinson milled about. There was an unexpected country contingent in the house -- Brad Paisley and members of the Dixie Chicks -- as well as other musicians, among them Jack Antonoff and Anthrax's Scott Ian. (Anthrax recorded a song for a Game of Thrones mixtape that actually exists.) I also spotted Sarah Paulson, Keegan-Michael Key, and Turner's fiancée, Joe Jonas. After the message from Sansa and Arya, we were treated to some of Ramin Djawadi's score on the venue's organ, before the speechifying began. A common theme: How unlikely the success of Game of Thrones actually was. "Anyone who tells you that we knew this show was going to be the hit it is when we launched it would not be telling the truth," HBO's Head of Programming, Casey Bloys, explained, referencing incredulous pitch meetings, the incredibly expensive pilot, and almost as unbelievably costly reshoots of that pilot. Showrunners David Benioff and D.B. 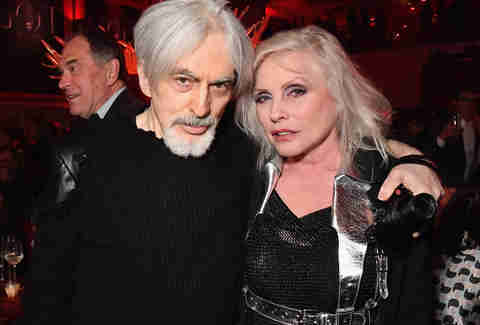 Weiss paid homage to George R.R. Martin: "George, thank you for letting us take your children into our care, sorry we didn't treat them better," Weiss said. Finally, before the strains of the indelible theme started to play, the curtain rose to reveal the entire cast standing in a vast line. The audience rose to its feet in applause. The stars headed to their seats -- all save for Kit Harington, who had to go across the street for Saturday Night Live rehearsals (he's hosting on April 6) -- and the episode began as the cast shuffled by. It's hard to complain "down in front" when the people obstructing your view are Brienne of Tarth (Gwendoline Christie) and The Mountain (Hafþór Júlíus Björnsson). And beyond that I can't really say anything else. I don't want Arya to murder me, after all.